This is part 3 of a series, see part 2 and 1 first. "Great, I got a fail team again!" - this is something that many good players say when they look at the map, seeing a mindless zerg going somewhere. It has the infamous name "lemming train", as they are like the little rodents whose population suffer heavy losses during migrations. The lemming train can - and usually do - lose the match, totally out of your control. "Fail team" indeed. But "I got a fail team" is also infamous for being a bad excuse. After all, in a random match the enemy has equal chance to get a bunch of scrubs whose mental capacity equals a furry vermin. It's not like the matchmaking giving you bad players to lose. I mean it could but why? The bad players are customers too, any cheated machmaking would want to give them wins, not losses, so they can't be used as a tool to make you lose. We have to accept that your average teammate isn't dumber than your average opponent. 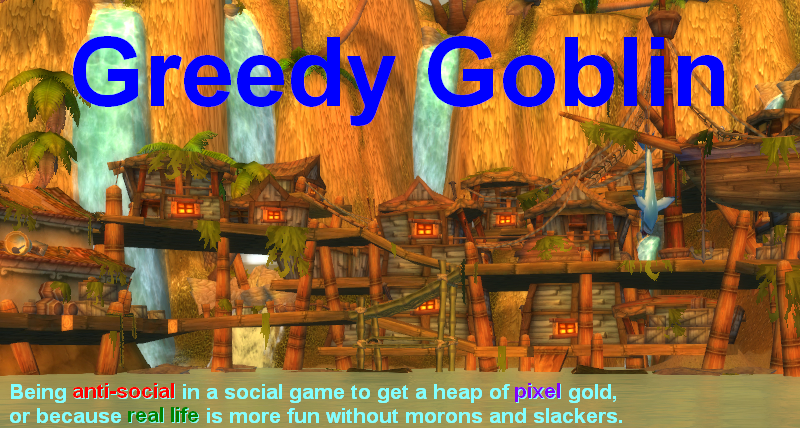 Then why do you often get mindless lemmings? One thing is for sure, the game systems can't control other players, right? Right? 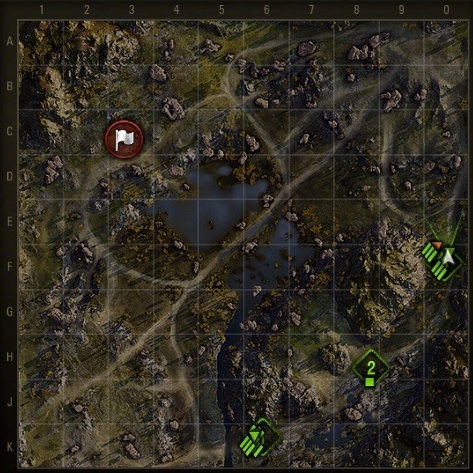 This is the map of a Karelia Assault game, before it started. You can see 5 tanks on the left, 2 of them are scouts. 10 tanks on the right, only one scout. Would you be surprised if I tell that the game was lost with a lemming train going on the right while the left side was washed up? 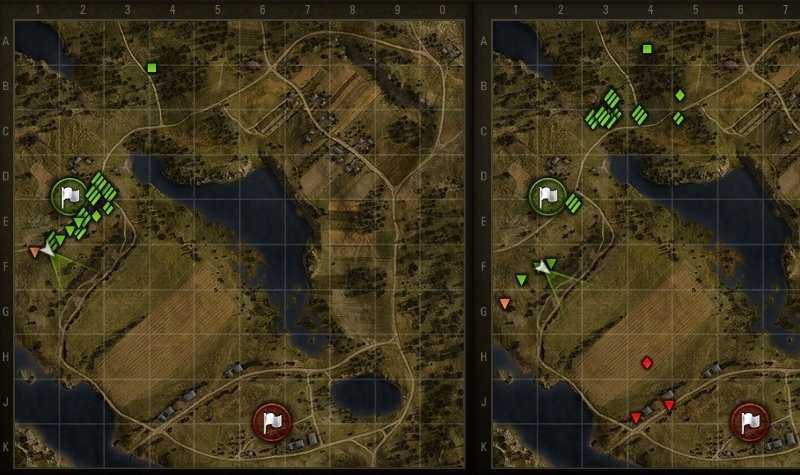 Same map, but 7+6 tanks (scouts and arty are not combat tanks) on both sides instead of 3+9. We won, I wonder why? Himmelsdorf, encounter. Capturing the hill is crucial in this game. The 3 tanks in our team that are best for that job are the only Tier 8 ones, the IS3 and the two AT15s. You can see that the AT15s are very far from the hill, facing away. We lost. 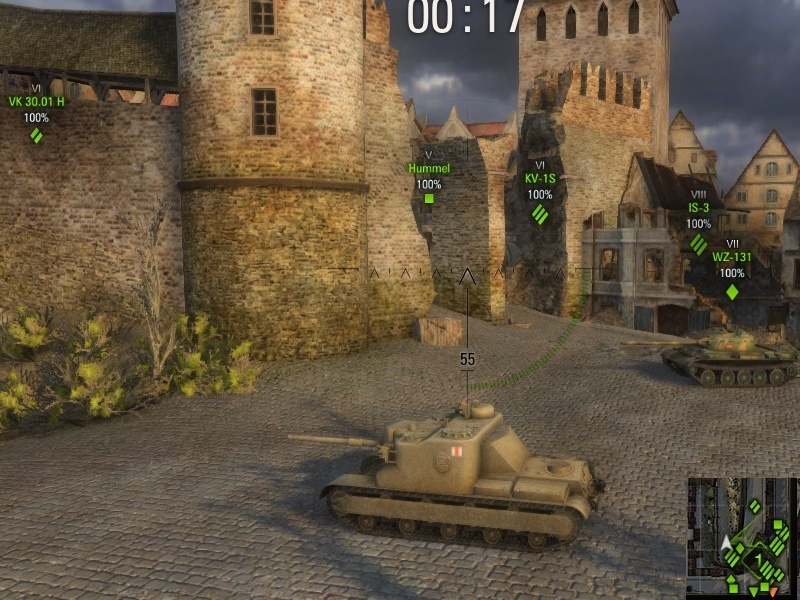 Wouldn't this game be different if the AT15s were in the places of the Hummel and the VK 30.01 H? In encounter and assault battles there is little time to relocate before contact with the enemy. The placement zones are often divided, like you can see on the Karelia maps. Initial placements have large effect on the outcome even if the players recognize the problem and react. I mean the proper action in case of the first Karelia match was to wait until 2 heavies move from right to left. During this time the enemy could advance and take positions. However this is theoretical as most players are equal with a lemming in terms of strategical planning. They go where they expect contact with the enemy sooner. They will not relocate, they will not think if their action makes sense, they go to "have some fun". Place them to left and they go left. Place them right and they go right. Your team isn't inherently worse than the enemy, but they are both controlled by initial placement. If the enemy is placed properly and your team is misplaced, you get a "fail lemming horde". If your team is well placed and the enemy is misplaced, you get a "GJ team we owned lol"! Ensk, normal battle. Above you can see the initial placement and it doesn't take a genius to guess that a lemming train will go to the city. Below you can see it in action, 30 seconds into the battle. We lost with the enemy capturing the base while 7 lemmings still alive in the city. Erlenberg normal, perfect placement. 4 tank destroyers defending the north bridge, all tanks placed for a South assault. 7 enemies marched to the north bridge where they were easily stopped losing only 2 TDs. Crossing the bridge under fire is hard. Malinovka, near-perfect placement: tank destroyers on the left, heavy tanks as close to the hill as possible. On the right you can see it after 30 seconds. This game was won before it started. Tomorrow we'll see the logic and purpose behind the cheat with further proof. We must understand "why" to be able to design the counter: the exploit that will crush it. To summarise, starting position has a high influence on the final result? and the developer can easily use it to influence the result. I like asymmetric setups on Karelia assault; the defence is usually symmetric, so as long as *something* speedbumps their push via south-west, a big north-east/center push is a good way to win it. I would be fascinated to hear from someone playing the end game of "Clan Wars" to find out how the organized groups deal with this sort of random placement. So...it's a game with random shots that randomly penetrate to do random damage. You get less than 20 shots per battle most of the time. It places you on a random map in a random team that's randomly set up. The tanks are balanced but the equipment on them can vary hugely...in a kind of random manner.The team is pretty big which further limits your influence. There's a huge huge amount of battles going on every day so things that have a 1 in a million chance can happen ten times a day in different places. Given all of the above your theory sounds like apophenia to me. Have you considered the option that if every one of these factors is indeed just random the effect would be the same? @Anonymous: it's hard to decide if you are a troll or just bad at maths. The outcome of a single match is strongly affected by luck. The average of hundreds of matches is not, as there is one non-random factor in all battles: you and your tank. So you are saying that WR over a long period of time is not affected by luck, but by the actions of the players? Refuting all your earlier argument. Usually in a clan wars match the first few, or even half the match is a waiting game. Poke and prod to see where the enemy is set up. A lot of strats require tanks to be in certain places. We won't execute a push until everyone is ready. What absolute garbage! Your Karelia screenshots just prove you have no clue what you're talking about. The balance of the force is radically different, the second screenshot shows many more heavies so ofc there's going to be a better balance between the two start locations. Your Ensk map experience is just the occasional retard battle, the starting position would be ideal IME for an experienced team as you can defend the East flank with the 3 meds and push through the city with the bulk of the force, often a winning strategy. There's no penalty with that starting placement at all it's just no one on your team went back to defend the flag (I have no clue what the 3 meds did during the battle, they may have pushed up too far and got killed rather than holding the flank. There's nothing special/perfect about the Erlenberg TD placement either, it's extremely common at least two TDs will spawn by the bridge - whether they just hold the bridge or push up to B2 is dependant on the players. Even the Malinovka pics don't really show anything unusual, even though there may be a heavy bias to the East (again this is standard in a battle with a large heavy/TD bias on the team) I've still been in numerous battles where the East spawning heavies would still have moved down to camp the field rather than pushing the hill. I see absolutely zero evidence you've presented for MM biasing spawn position dependant on player skill. To all "lemming" here, i have played with 4 account and likely over 25k battle total from t10 to t1 from arty to td and so on. If this guy has nothing to tell and has no meaning why the hell WG react with reporting the same thing to be patched with the next patch? Why game-play is affected with every patch? Why there are numerous bugs reported on closed beta and yet still not patched/corrected? And finally how it happen that with overpowered tanks we lose against underpowered enemy? Shots misses on accurate guns and shots hits from 500+ on inaccurate guns (even tho they said many times visibility is not possible over 500 meter yet You can aim and hit over 650+)? I think this guy say something important, visible in game industry, how they want to force the free2play game model into a pay2win model. I'm taking a break from WOT. 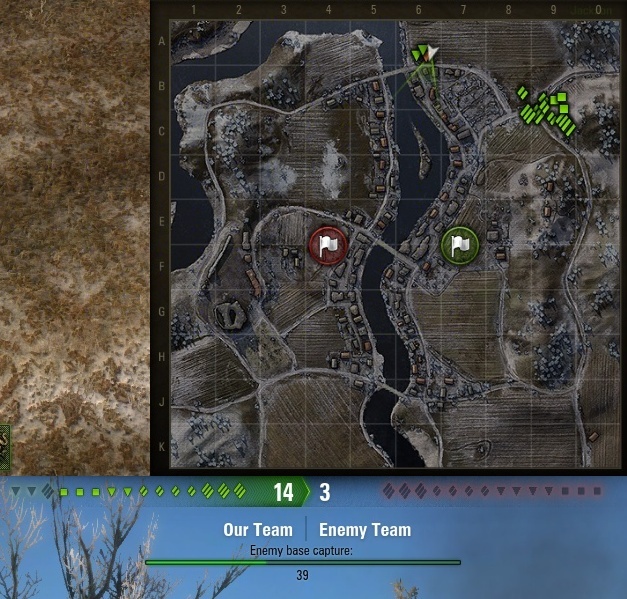 I'd like you to gather more data concerning the placement on map inside teams of the start of each battle. 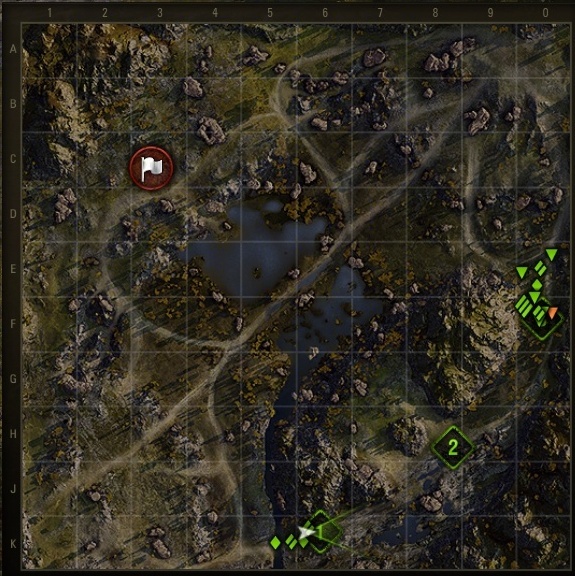 One example does not show a rigged thing ( maybe in all games the tanks are placed the same way at the start of that map). Basically a big influence is given be random vs. tank company. Example: the noted Karelia assault. In a random game, an uncoordinated lemming train has a high chance to fail. Unless the poorly protedted side contains really good players. In a tank company you often only leave a small defense on one side, whil the main attack force is taking the other side, which is quite often leading to vistory. The magic word here is coordination. In case of Karelia you had a perfect chance to win. 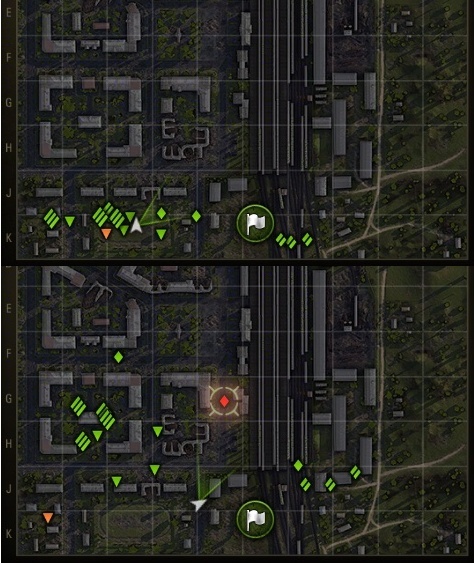 Your 3 tanks on the left just show themselves from time to time and bind some enemies, while your rush team at the right just sweeps the defenders. And if the left breaks – no problem, you even don't worry about arty's – only 1, it's not that important. If the enemy comes in strength to your left, their tanks on that flank are just useless, while you have HUGE advantage on your right. Himmelsdorf – you really don't need the mountain. It's quite enough to control the road downhill. Usually the most important lines are the railway (3 quick tanks capture the base, arty+some forward rush prevent enemies from recapturing it) and, in some cases, the "banana" – locking their mountain forces there is as well as killing them. Of course, the starting position matters. But it's never decisive – you just have to use your options in the best way. If you can – you win. I have played WOT for a year or so and I definitely DEFINITELY have the feeling something is up, and have done for a while. Every now and then I have a match where I light tanks up, all hits are bonus, I kill everything including some goddamn impossible shots and its nada to do with me and my supposed skill. I have been muttering to meself that the game is rigged, along the lines of "I'm crap but I can kill everything sometimes" akin to getting trip 7's on a fruit machine now and then because... yup, ya plug more money in! Game is set up for the rig because who decides whether ur shot hits or not and how much damage it does? The DEV. I have had games where I have hit a tank and murmured, [instead of muttered], "that is impossible, no way I could of hit that from here/I aimed well well wide etc etc". But, if I never hit anything I would quit, emo rage style, which is no good for the DEVS, as I might spend some money (never have never will). To sum up, computers dont do luck and the game is rigged to shiz in order for peeps to keep playing and hopefully deposit some money. Remember: if your shot hits/does damage/lights the tank up/incoming ricochets etc etc is all up to the DEV. The DEV wants ur money and will groom you to get it. Where is next the instalment of WoT cheat and how to exploit their blatant server-side cheating ? One day you win +40 wins over losses the next you can't penetrate a paper tank! It's so obvious when the server is handicapping you.